As you know, we have had the same wonderful design team for many years. Several of these talented ladies have been with me since day 1. I remember all too well sending each email. I remember being afraid that they would say "thanks, but no thanks". To my delight, they accepted, and have continued to delight me ever since with their incredible designs. I did not realize what a special place each of these ladies would carve into my life - my history. And I can not thank them enough for all of their hard work, creative genius and support! But it is time for these ladies to pass the reins over to a new group of talented ladies. They have some big shoes to fill, but I believe they are up to the task! 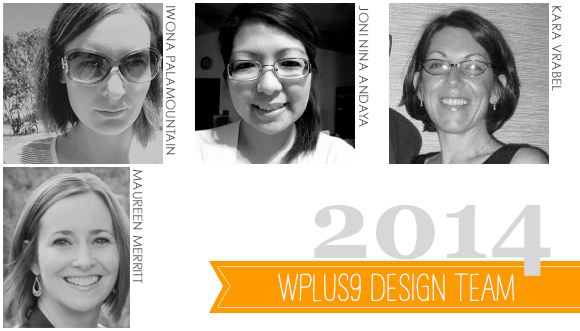 I am pleased to introduce the 2014 Wplus9 Designers. Each of these ladies are avid supporters of Wplus9 and I am sure that you will recognize them! 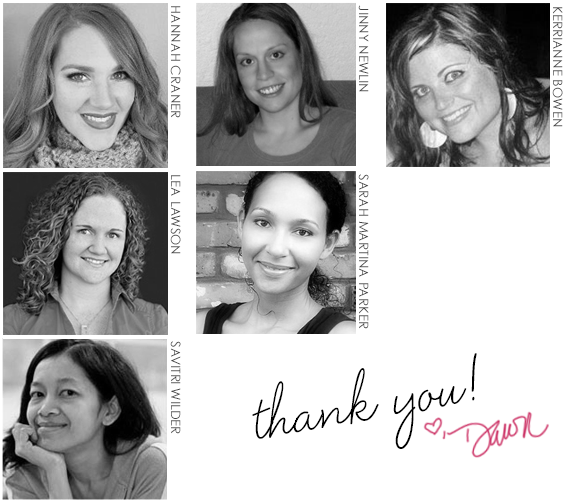 I hope you will join me in saying "thank you" to Hannah, Jinny, Kerrianne, Lea, Sarah and Savitri for providing us with so much creative inspiration over the last several years. This is not farewell, because I will continue to follow each of them, as I hope that you will. And a great big "welcome" to Chupa, Joni, Kara, and Maureen. I can not wait to see what is to come from this amazing group of crafters! 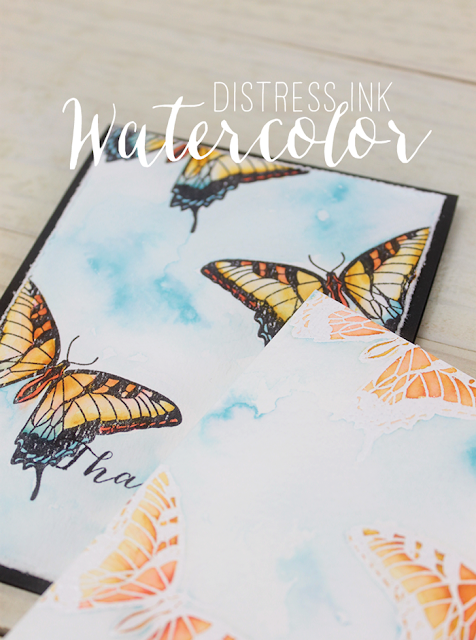 As promised, I have part 2 of the Distress Ink Watercolor videos to share with you today. 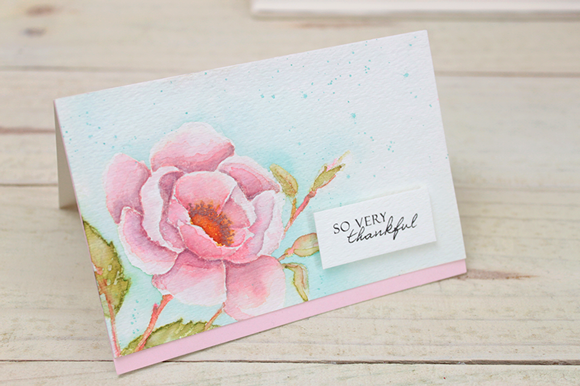 In this video, I'll show you how to use your stamps and DIY carbon paper to create guides that you can use to create gorgeous watercolor paintings. And just like before, this technique uses supplies that you most likely already have on hand. The video is a little on the long side. But I hope you don't mind. Again, I tried to include all of the steps and provide as much information as possible. Hopefully this will help you be on your way to creating you own little masterpieces! Enjoy! This is such a useful technique. And in the video, I also show you some other ways to utilize the DIY carbon paper into your cards. Why not sketch out your own designs? Now, I know what you're thinking, that's a lot of work for a card! 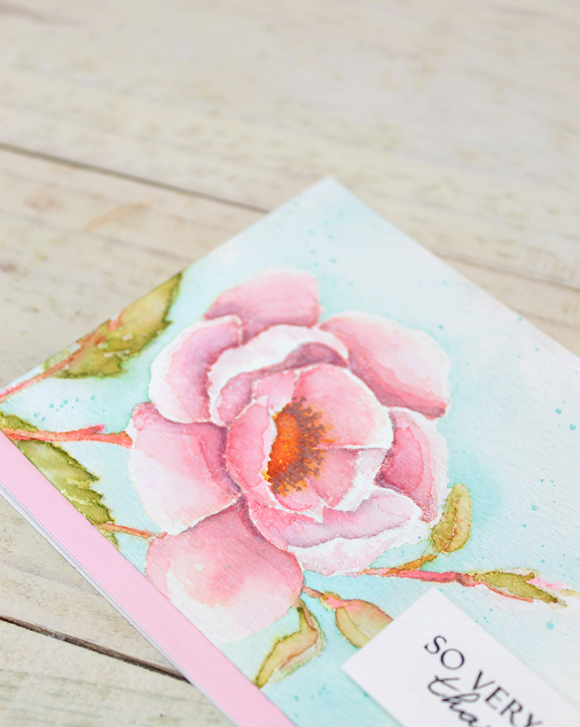 Well why not sign your painting and adhere the sentiment and painting to your card base with removable adhesive? Then your recipient can easily remove the painting and frame it. A gift and card all in one! Hand lettering has had a resurgence in popularity lately. I'm not brave talented enough to just go to town and create gorgeous hand lettered sentiments on a whim. But, with an eraser and some vellum, I can get it right...eventually. This way I can take my time and create a template to use again and again without ruining my final project! 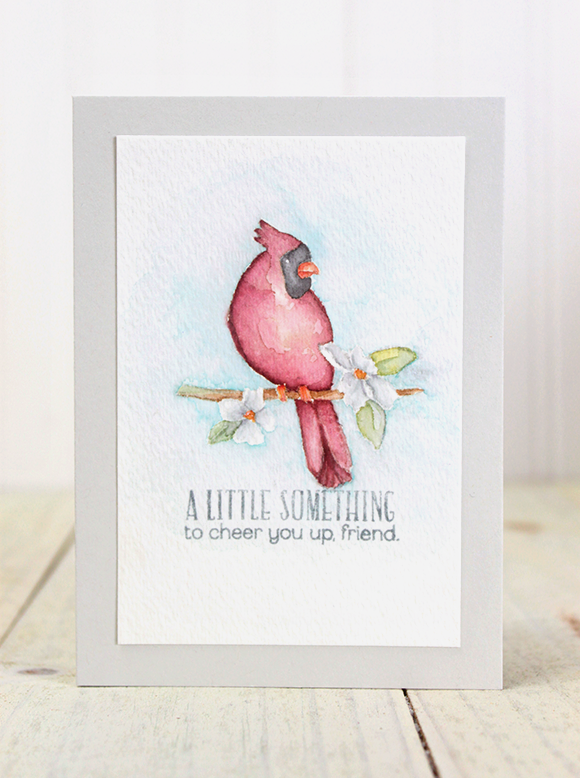 For this card I traced over the sentiment with a Versamark Pen and then embossed it before adding my watercolored background. Hopefully this gives you some ideas on how to personalize your cards and have some fun in the process! Thanks so much for stopping by! The other day I posted an "experiment" with watercolor using Distress Inks. Several of you wanted more information on this technique...so here it is! I've tried to make the video as informative as possible, including a full supply list. As mentioned in the video, part 2 is coming. It's definitely a little more advanced, but so worth it. Thanks so much for stopping by! Have you heard? 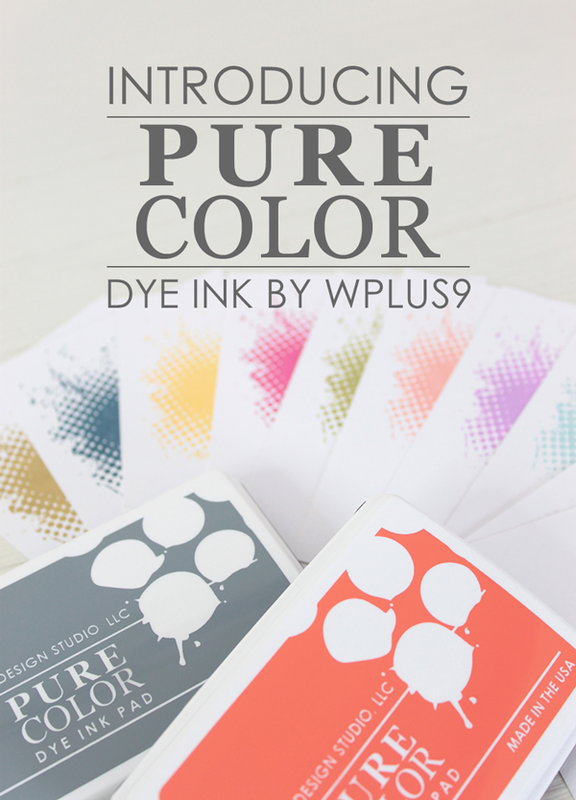 Our new PURE Color Dye Ink is now available at wplus9.com! I love all of the colors, but I'm a sucker for blue. So one of my personal favorites is Lake House. 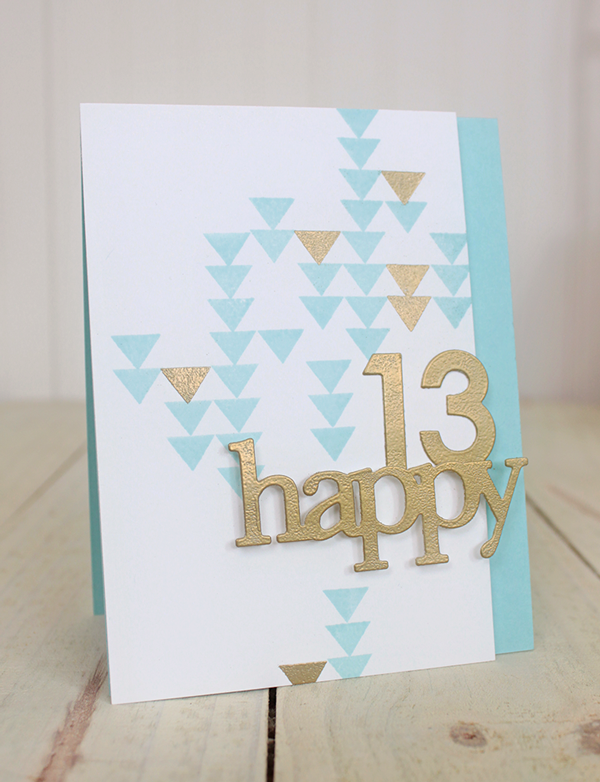 I decided to pair it with a graphic layout and gold embossing for today's card. Oh, and in case you were wondering...13 happens to be my favorite number. 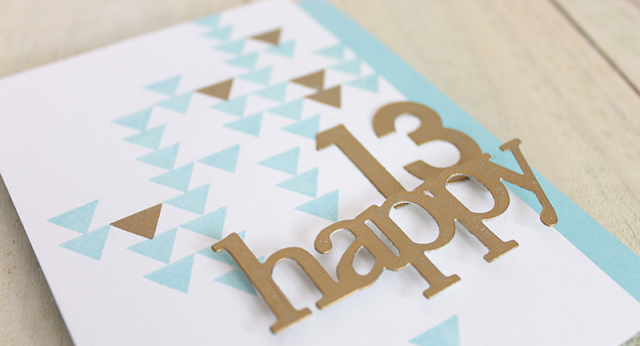 Another of my favorite things lately seems to be gold embossed die cuts. I think this would make a great card for a boy just coming into his teens. It's not too stodgy, yet not cutesy or childish. Switch out the Lake House for Sweet Gelato and it would be great for a girl! If you haven't already...you can check out all 10 new colors of ink here, or click the graphic below. 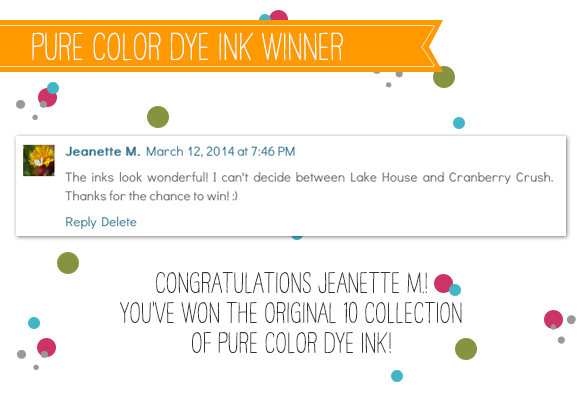 Congratulations to our random winner, Jeanette M! Please email customerservice@wplus9.com, subject line: "PURE COLOR Winner" with your address information so that I can get your prize out to you. I am so overwhelmed by the amazing response to our ink debut! Thank you all so much, I just know you are going to love them! You don't have to wait much longer to get yours. And, no need to wait up until the wee hours of the night to purchase either! They will be available for purchase at www.wplus9.com by 12:00 p.m. EST tomorrow, March 17, 2014. Full list and email notifications coming soon! Hey guys! 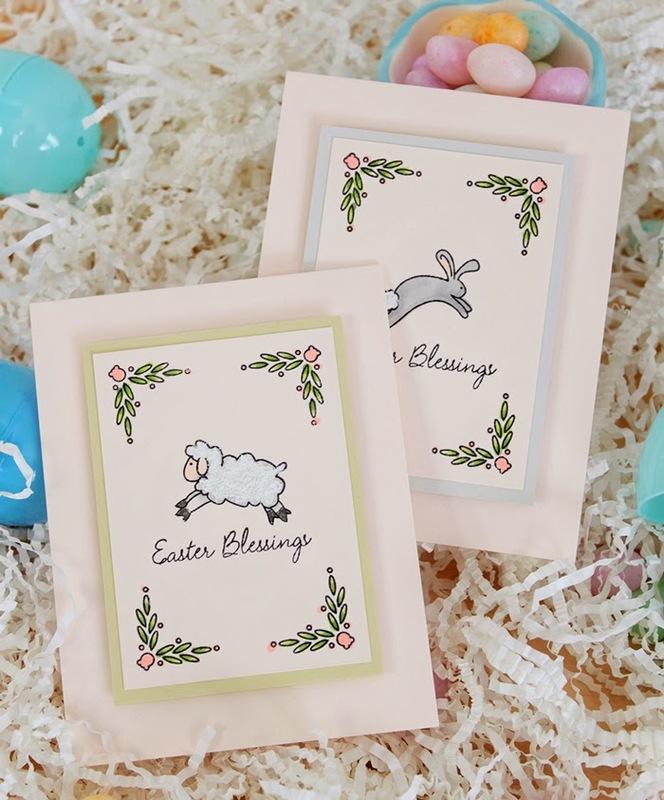 I've got a duo of clean and simple cards to share with you today and a video. 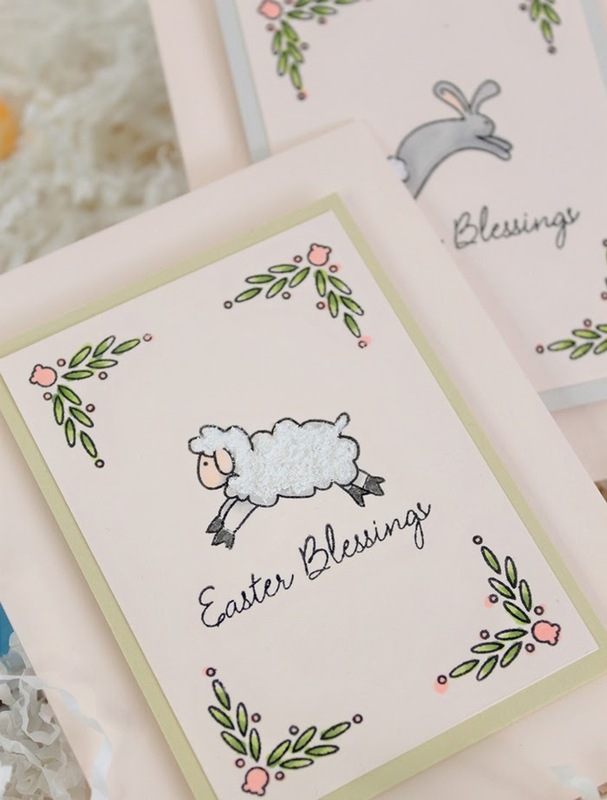 I wanted to give you a closer look at the Easter Blessings stamp set and our newest card stock additions. I think the soft colors are perfect for spring and Easter. I also wanted to share a fun find with you that's perfect for creating the "wool" on the lamb and the tail of the bunny. In my search for embossing/modeling paste, I stumbled across White Texture Effect by Martha Stewart. I wanted to see if it would work with stencils. And while it does...sort of...it's not quite what I was envisioning. I thought it was money wasted until I realized it was perfect for this set! And it would be great for creating "snow" on those winter cards too. 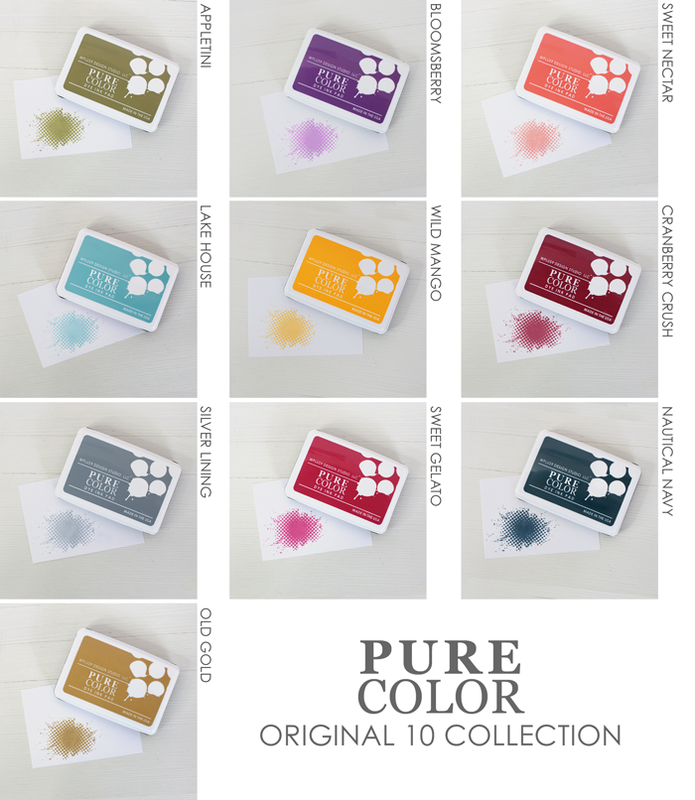 And don't forget, if you haven't already, check out our PURE Color Dye Ink preview and leave a comment on this post to enter to win a set! If you follow us on Twitter, Facebook or Instagram, then you already know that the NEW Wplus9 PURECOLOR Dye Inks are coming soon! March 17, 2014 to be exact. That's right! All of these will be available for purchase on March 17, 2014, at www.wplus9.com as a whole collection and individually. The Original 10 Collection is not only the perfect color starter kit, but it is also a great addition to any ink collection. 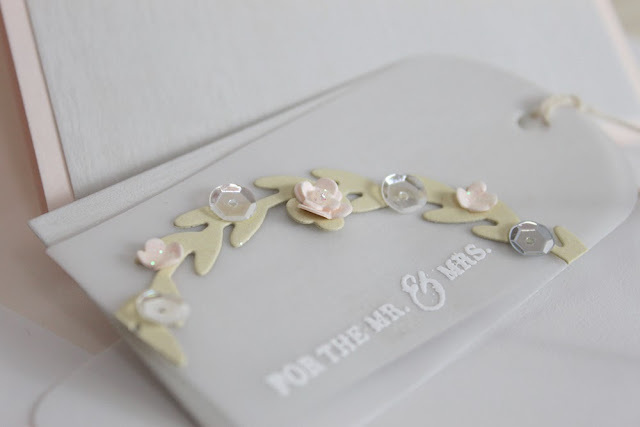 Each color was hand picked to coordinate beautifully with one another. You'll find so many different color combinations among just these 10 colors. Vibrant color and even coverage for easy stamping. I've been previewing these inks over the last couple of weeks and I can't express how happy I am with them! You can see some of these inks in action here, here, and here. Now, we can't do an introduction with out a giveaway, can we? Of course not! So, if you would like to win the entire Original 10 Collection, just leave a comment on this blog post by 12:00 p.m. Sunday, March 16, 2014 and I will choose one random winner! I'd love to know what your favorite color is, or which of the Original 10 colors is your favorite! The winner will be posted by 5:00 p.m. Sunday, March 16, 2014. Hello and happy Friday! I do believe I owe you all a winner, don't I???? Congratulations to our random winner, Cara! Please email customerservice@wplus9.com, subject line: "OCC Clean & Simple Class Winner" with your email information so that I can pass it on. Class starts on Monday and I am so excited! 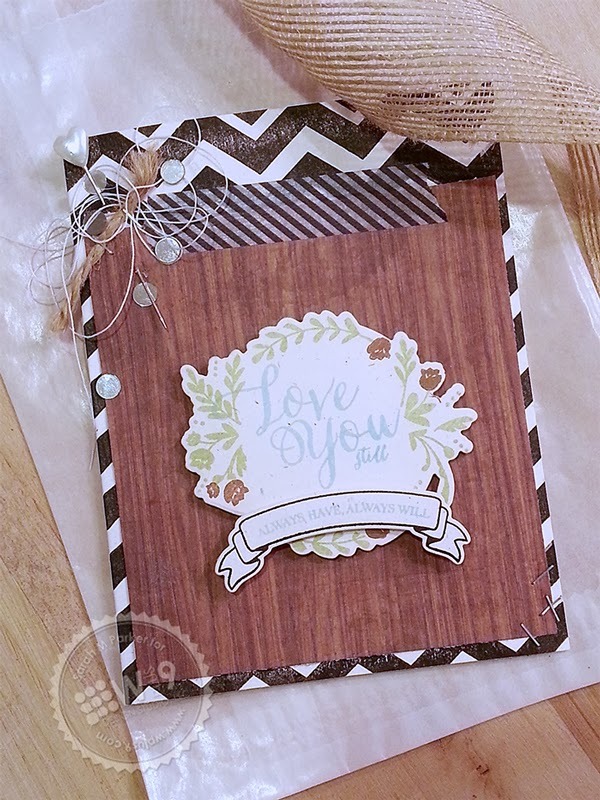 I am so humbled to be included in this class with so many incredibly talented crafters. I can't wait to see what everyone has created and to learn some new tricks! Let's face it. We all have favorites. They may change from time to time, but there's always one stamp set or craft product that we tend to reach for over and over, or worse yet, hoard because we can't bring ourselves to use it up. 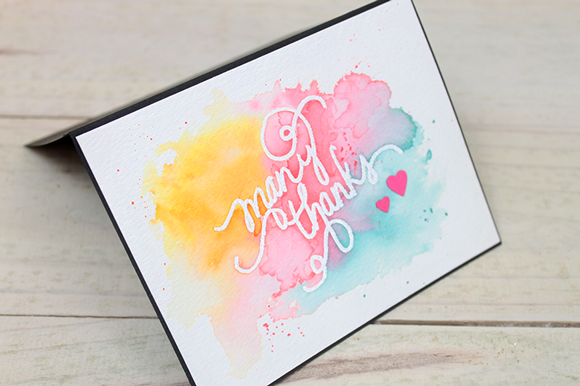 Today, Sarah Martina Parker is sharing her current favorite Wplus9 stamp set. Sarah's current favorite is Valentine Wishes. (which is now back in stock) I can't say that I blame her. I just love the fonts in this set. I *wish* my penmanship was half that beautiful. 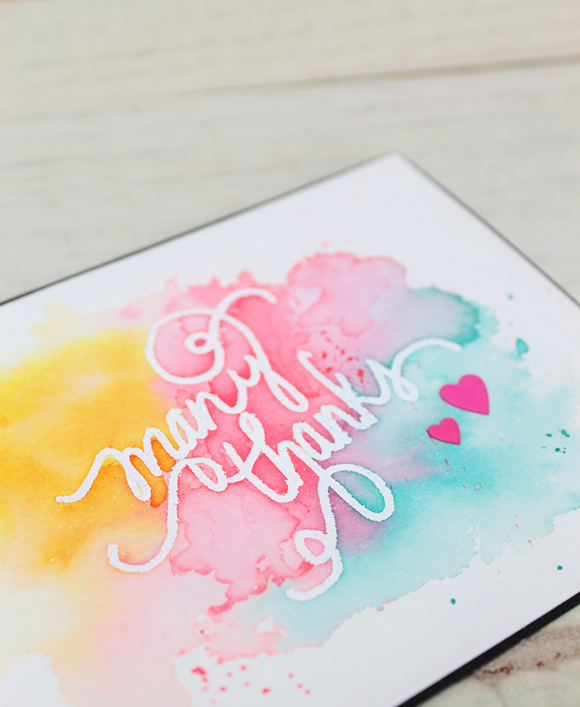 And she's used my current favorite - the mix of bold/graphic with soft and feminine flowers! How about you? What's your current favorite? 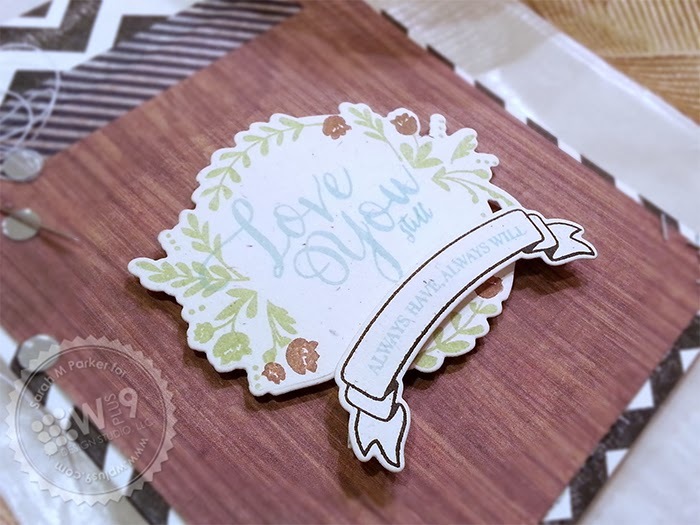 Today's project features the newly released Spring Wreath Die along with three of our new cardstock colors. 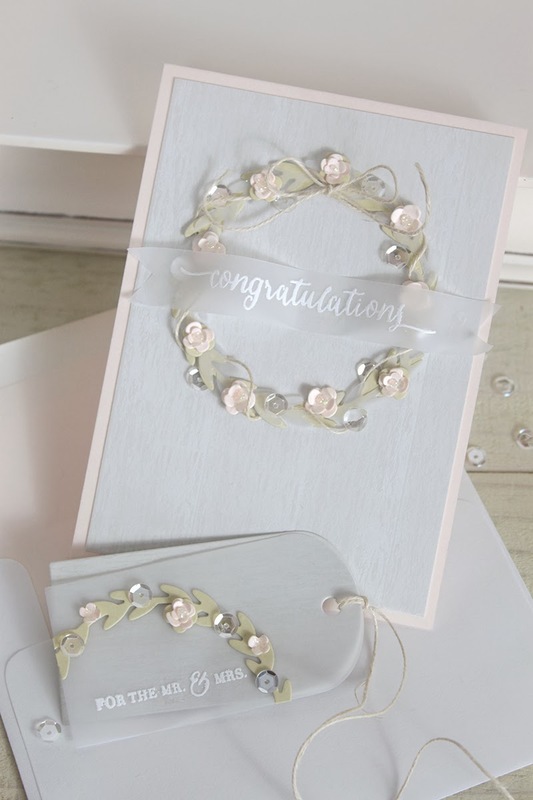 I started out by stamping the wood background from Dockside Backgrounds onto our Dove Grey cardstock in white. I just love the combo of white with this super soft shade of gray. However, it's the wreath that really steals the show! I cut the wreath out twice, once from vellum and another from Soft Honeydew and layered them together. I used a length of twine to wrap around the wreath and tied it in a bow at the top. For a little sparkle, I added some of my new favorite sequins from Pretty Pink Posh. The flowers were die cut from our new Cashmere cardstock and stacked starting with the largest on bottom and ending with the smallest on top. A little Glossy Accents between each layer holds them together. I added another small drop of Glossy Accents to the top and sprinkled it with glitter. Once they were dry, I used my fingernails to bend up the "petals". To give the card a matching tag, I used many of the same elements and techniques along with a sentiment from Fresh Cut Wreaths. I knew that I wanted to do something special for the sentiment as well and I am so happy with how this turned out! 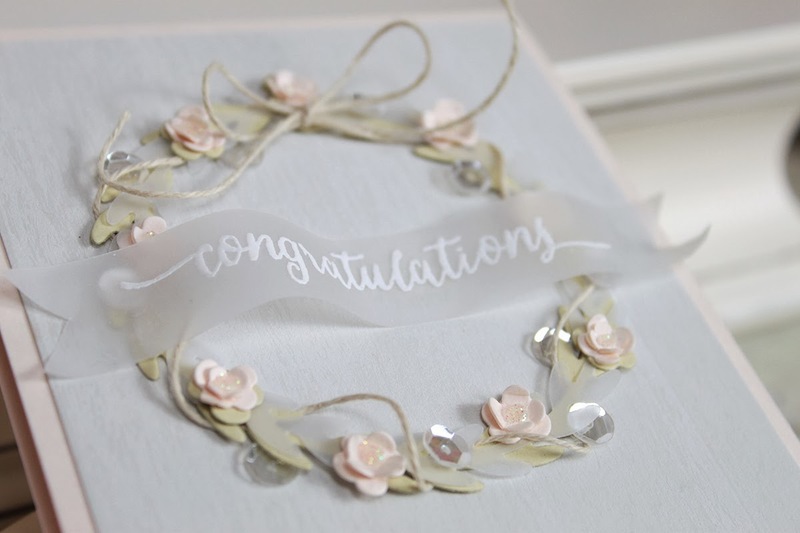 I stamped the "congratulations" sentiment from Fresh Cut Wreaths and embossed it in white on a strip of vellum. Guess what? I found my vellum tape runner! So, I was able to trim some banner edges, create a wave in the banner by sliding it along a pencil, and adhere it so that it retained the wavy pattern. LOVE! 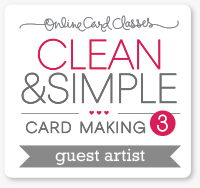 If you haven't already...don't forget to enter to win free registration to the newest Online Card Class, Clean & Simple 3! 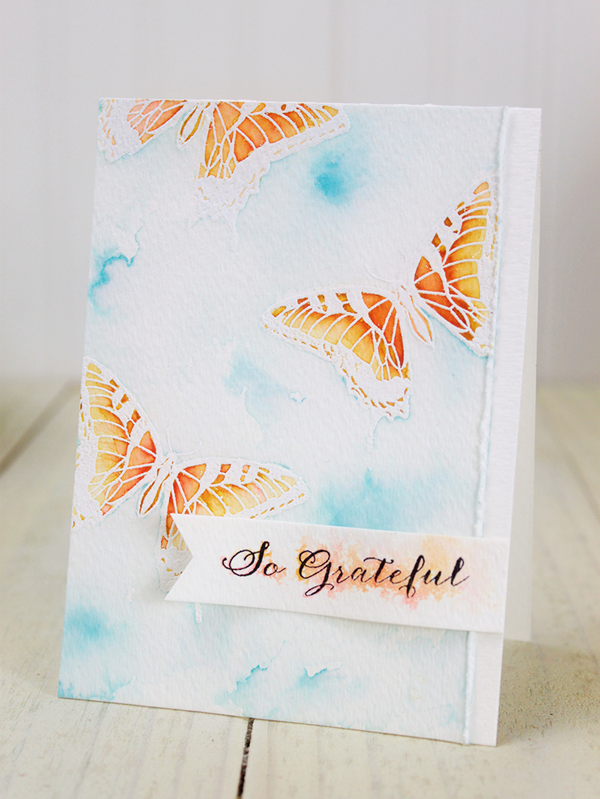 Simplify your card creations for maximum “wow”! Join Kristina Werner, Jennifer McGuire, Julie Ebersole and guest artists (including me!) for another round of the ever-popular Clean & Simple Cardmaking class series, Clean & Simple Cardmaking 3, which shines the spotlight on one-layer cards! 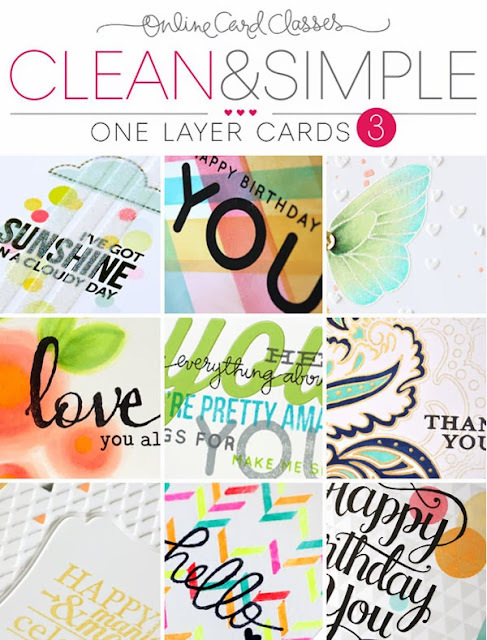 In Clean & Simple Cardmaking 3 from Online Card Classes, you’ll learn over 20 fabulous ways to create one-layer cards with a clean-and-simple style. Whether your definition of clean-and-simple is a simple technique with big impact or a bit more time-intensive technique with clean results, you’ll find a wide range of new ideas, videos and techniques to spark your creativity. 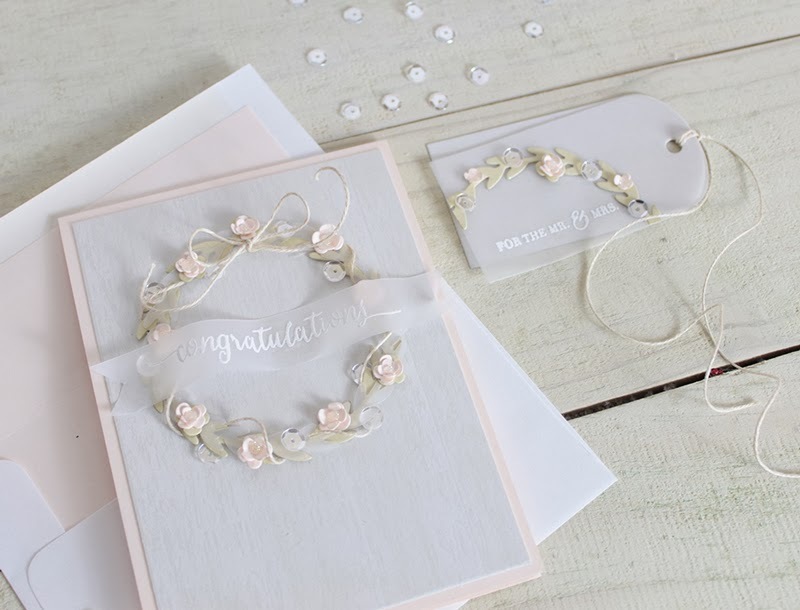 Head on over to Online Card Classes to sign up for Clean & Simple Cardmaking 3 and discover for yourself the all possibilities in one-layer cards. Class starts March 10, but you can take it anytime – you will have lifetime access. I am so excited to be participating in this class! 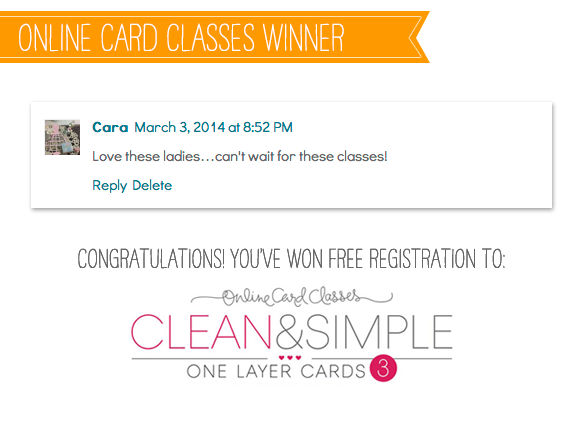 And, the wonderful ladies at Online Card Classes are allowing me to give one of you free class registration! Sound like fun? Just leave a comment on this post by 12:00 p.m. EST on March 7, 2014 to enter. I will select one random winner and post by 5:00 p.m. on March 7, 2014. 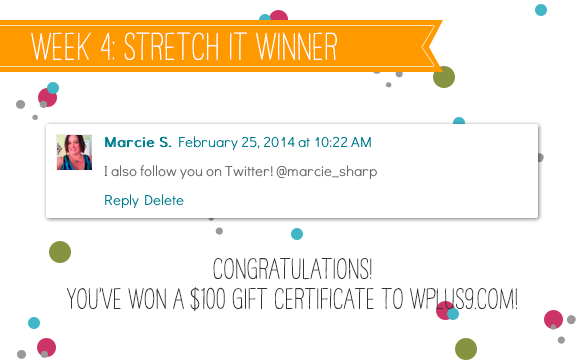 Congratulations to our random winner, Marcie S! Please email customerservice@wplus9.com, subject line: "Birthday Celebration Week 4 Winner" to claim your prize. I want to thank everyone for joining us for our birthday festivities throughout February. I am so happy that you all enjoyed the challenges and played along. I am still making my way through all of the entries, and they are amazing! There is so much talent among all of you and I feel truly blessed to be a part of this community. We still have so much more to share with all of you, so be sure to check back often throughout the month of March. 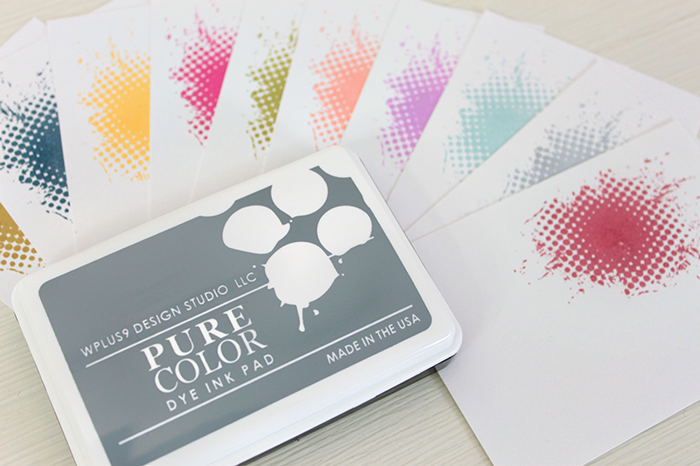 We have some exciting announcements, the launch of our new PUREColor dye inks, more giveaways and more inspiration featuring our February 2012 release! Be sure to check back a little later today for the first giveaway. You won't want to miss this one! A great BIG "thanks" to all of you who support Wplus9, to those who joined us for our birthday celebration and congratulations again Marcie!